And, today’s YA author in the spotlight is: Matt de la Peña. Enjoy! AUTHOR: (information comes from the author’s website www.mattdelapena.com): Matt de la Peña has had four YA novels, a picture book, and several short stories published. His debut novel, BALL DON’T LIE, was published in 2005 and made into a major motion picture. The book was named as an ALA-YALSA Best Book for Young Adults and an ALA-YALSA Quick Pick for Reluctant Readers. His other novels, MEXICAN WHITEBOY, WE WERE HERE, and I WILL SAVE YOU were also recognized by the ALA-YALSA, the Junior Library Guild, and others. Matt received his MFA in creative writing from San Diego State University and his BA from the University of the Pacific, where he attended school on a full athletic scholarship for basketball. He lives in Brooklyn, NY. He teaches creative writing at NYU and visits high schools and colleges all over the country. FROM THE BOOK JACKET: Danny’s tall and skinny. Even though he’s not built, his arms are long enough to give his pitch a power so fierce any college scout would sign him on the spot. Ninety-five-mile-an-hour fastball, but the boy’s not even on a team. Every time he gets on the mound, he loses it. Ball ends up so far out of the strike zone it’s laughable. But at his private school, they don’t expect much else from him. Danny’s brown. Half-Mexican brown. And growing up in San Diego, that close to the border, means everyone knows exactly who he is before he even opens his mouth. Before they find out he can’t speak Spanish, and before they realize his mom has blond hair and blue eyes, they’ve got him pegged. But it works the other way too. And Danny’s convinced it’s the whiteness that sent his father back to Mexico. MY TWO CENTS: I don’t often read books about sports, and I have already read a lot of books about mixed-race cultural identity struggles. Because of this, I wasn’t sure how I would react to this novel. I picked it up because I had heard and read a lot about de la Peña. In the end, I wasn’t disappointed. The novel blends the major issues, so a reader can’t pin it down and say, “It’s a sports book,” or, “It’s a cultural identity book.” It’s both. And it’s more than that. It’s about friendship, family, love, pain, and the complicated process of figuring out one’s identity. I think it’s an especially good book for boys and reluctant readers because the issues and characters make you want to keep reading. 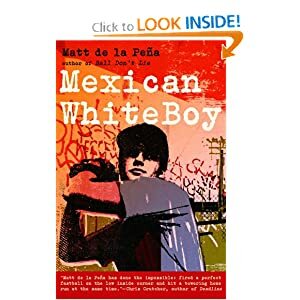 Find MEXICAN WHITEBOY on Amazon.com and Goodreads.